While writing this post, I could not resist referring to my calendar and realised that my reservation at Teppei Restaurant is not till June 2014, with my reservation placed on 2 January 2014. Yes, the queue is at least six months long. While the wait for my omakase at Teppei continues, we read about the opening of their sister restaurant, Hanare. 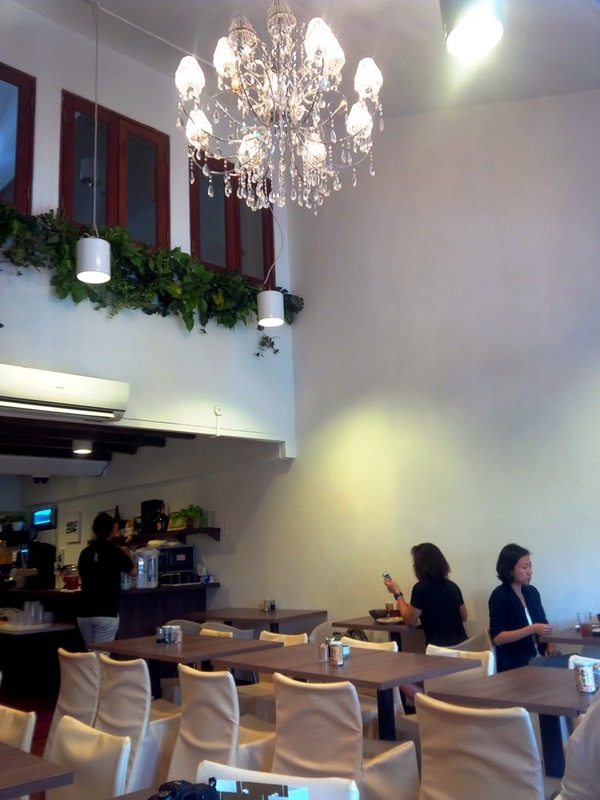 We jumped with joy when we learnt that this new offering is located conveniently in the vicinity of Tanjong Pagar, a short five minute walk from the MRT station. 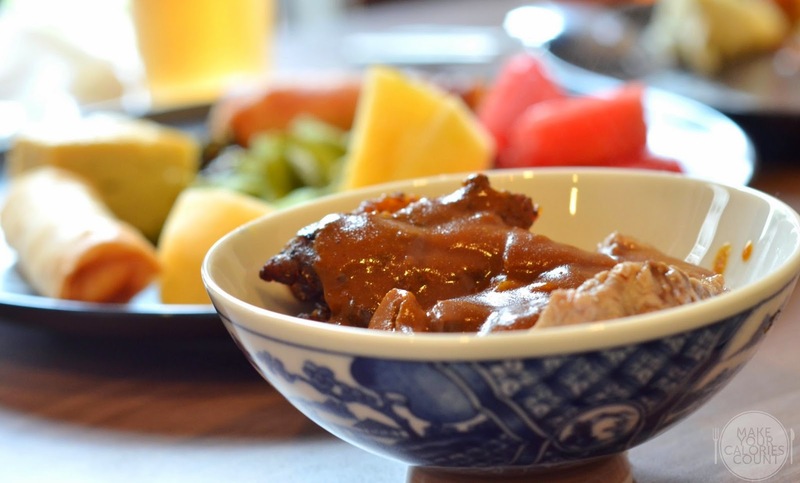 Unlike Teppei Restaurant, Hanare do not accept reservations and have a walk-in policy only for both their lunch and dinner seatings, at the same price. At present, there are only two options with no ala carte menu. All prices are nett and inclusive of GST and service charge. Do note that you are expected to make payment upon arrival. We opted for the buffet on this occasion and with more than 20 different types of side dishes ranging from curry beef to chicken cutlet. 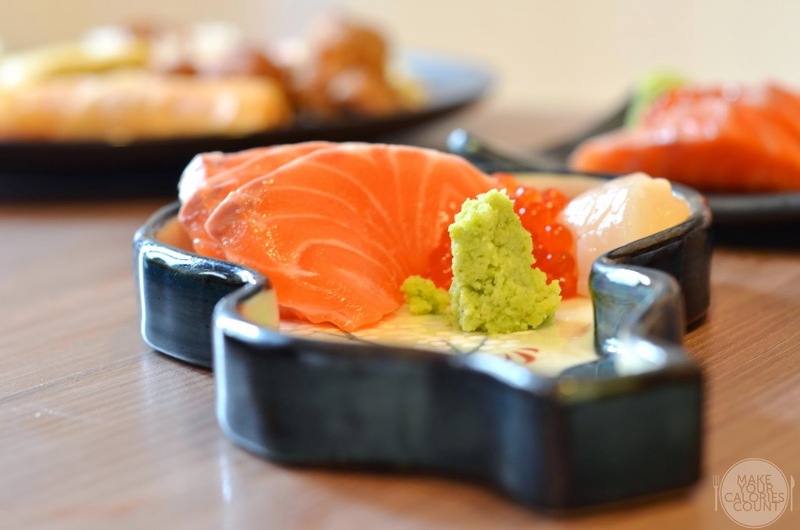 As part of the buffet offering was the daily special and on this instance, there were three slices of salmon and two slices of scallop sashimi. The bara chirashi, which essentially refers to a bowl lunch special is somewhat like a bento set with a fair share of sashimi offering. One would however be limited to four different kinds of side dishes, such as tamago ("egg") or seasoned vegetables. The sashimi slices were thick and fresh. 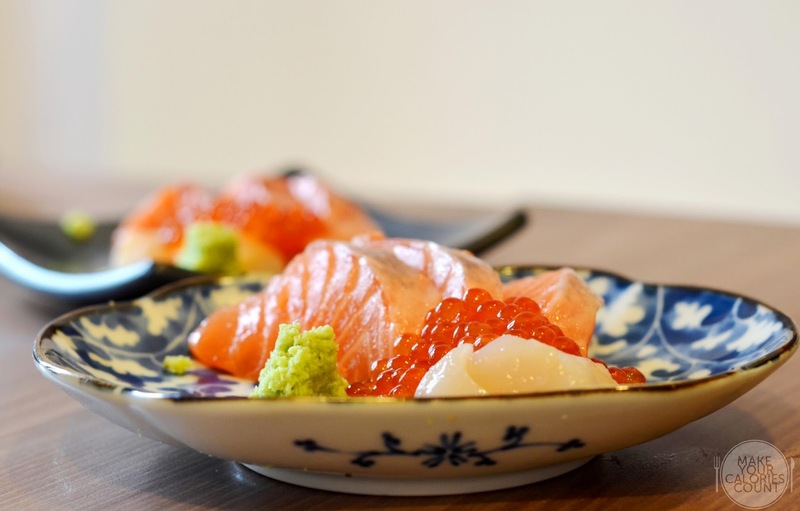 The salmon slices were highly palatable with three slices to each portion served alongside fresh salmon roe. What I particularly enjoyed was the punch of freshness from the protein and with the wasabi, it surely heightened our senses. The generous serving of salmon roe added a layer of glutinosity in texture with its gluey-ness while the salmon roe were firm and burst with goodiness with each bite. If you are a lover of salmon roe, this will not disappoint. After finishing our sashimi, it was time to check out what the buffet has to offer! Do not expect to be wow-ed with sashimi platter or the likes as the buffet features mainly cooked food such as chicken cutlet, spring rolls, seasoned and stir-fry vegetables and more importantly their signature curry dishes! The chicken and beef pieces were located beside the rice and curry pots though there were clear signage to indicate so. For those with a heavier appetite, load up on the fragrant rice, the tender chicken and beef and shower it with some curry love for a satisfying main on its own! Unlike the usual sweet Japanese curry that we are more used to, this was largely adjusted to the palate of local Singaporeans as it spotted a slightly spicier touch. We loved the viscosity of the curry and the heat was cleverly balanced with the appropriate level of sweetness. 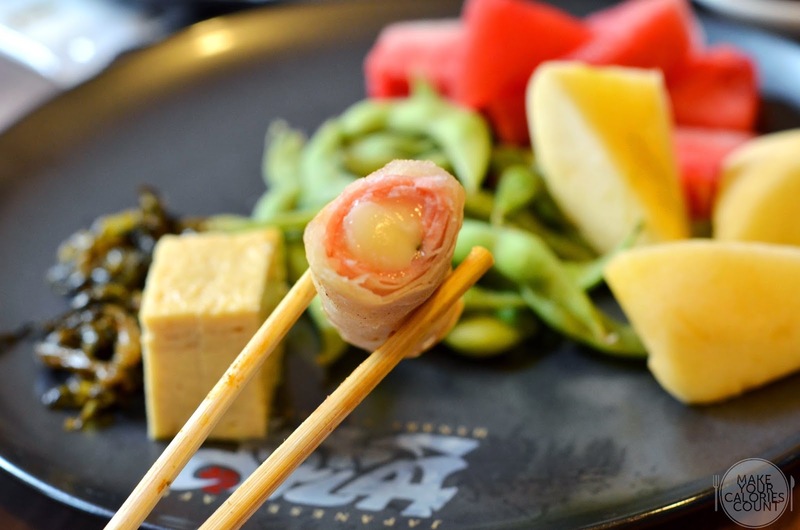 Quite frankly, the buffet offering was not particularly impressive, with the usual chicken karaage, edamame, udon, etc filling the trays but this spring roll caught our attention as it had a layer of ham and cheese on the inside of the fluff pastry. The interior was simply decorated with a touch of minimalism to it. We liked that everything was pretty much self-service, including free-flow of iced and hot Japanese roasted rice tea. Do not set your expectations too high prior to trying and you will leave the meal satisfied. If you are looking for free-flow sashimi sort of Japanese buffet, then this might not suit you well either. Overall, we enjoyed the lunch though it was a quick lunch affair before rushing back to Raffles Place! I liked that it was a no-frills dining experience, reasonable prices (considering that it was nett pricing) and the lady manning the counter was friendly and approachable. Would certainly return soon to try their bara chirashi set! 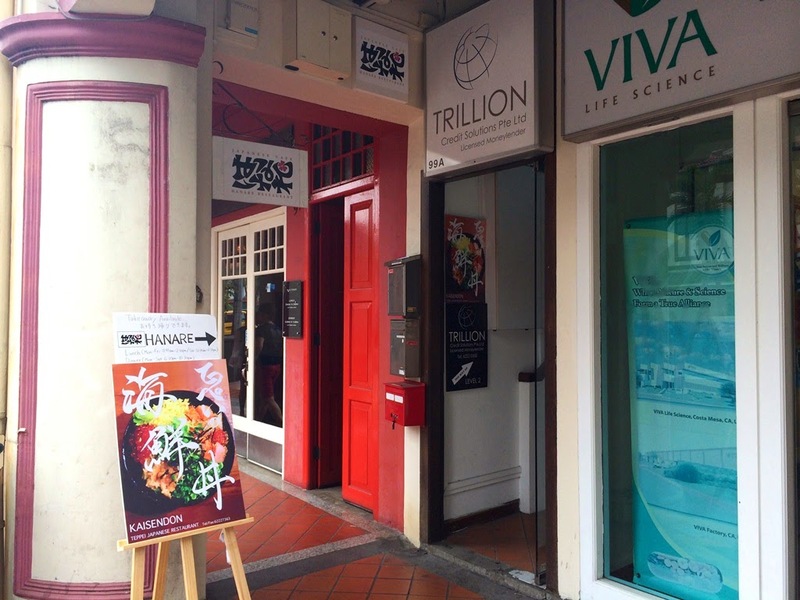 While they are open for lunch till 1430hrs, do note that they are also open for dinner at the same prices with the same offering till 2200hrs. Hanare is located on the first floor, therefore look out for this signage to enter the flight of stairs. 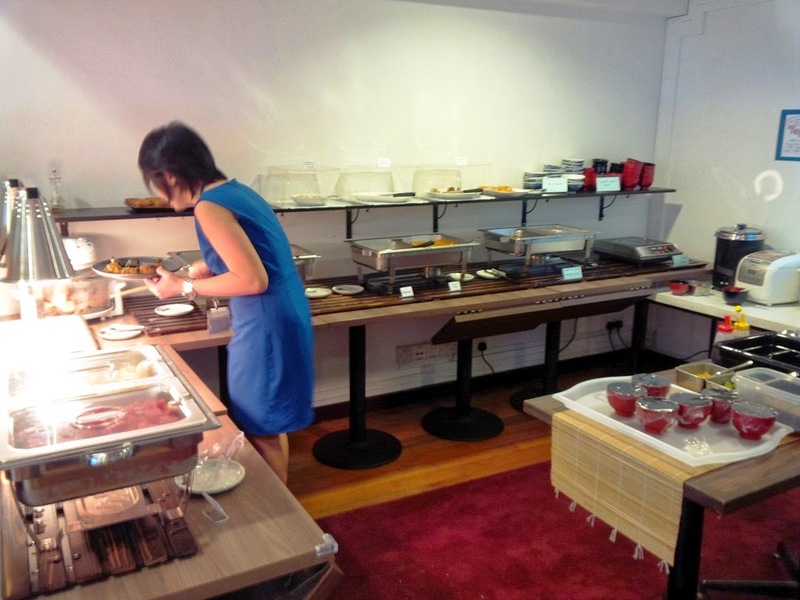 Hi, is this hanare buffet available for saturday lunch? same pricing? 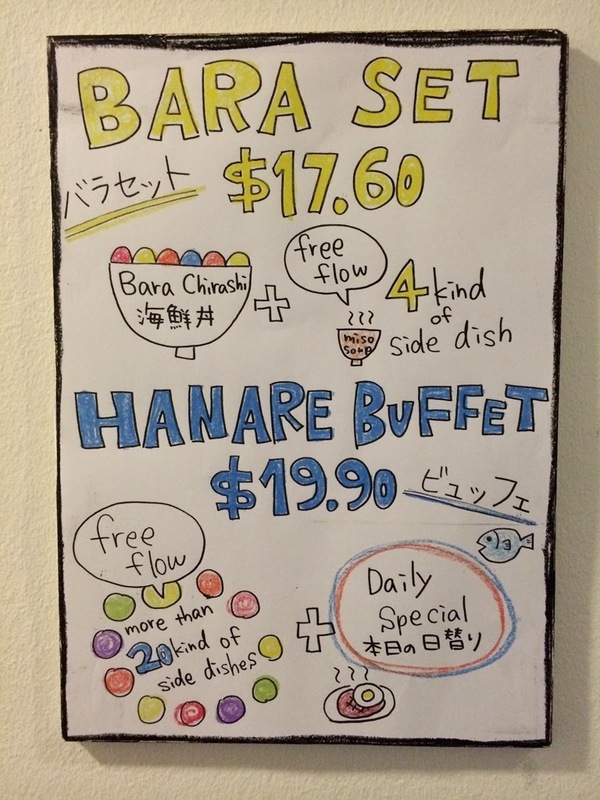 I went to Hanare, agreed with you I do not find the Hanare buffet spread impressive. Hence I ended up have the Bara Set instead. Pretty good with very generous servicing of sashimi with the bowl of rice.